Playforever toys are not called Playforever for nothing they literally go and go and go! We have had the super cool enzo motorbike in the COOP playspace for over a year now and it still looks and plays like new.We love simple, chic design at the COOP and Playforever toys are a modern parents dream toy. They are so stylish they even make a very cool present for adults. I have one displayed on my hallway console. 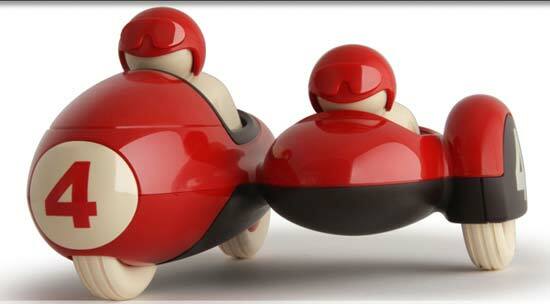 Playforever is a London-based toy manufacturer headed by designer Julian Meagher. Julian studied industrial design in Johannesburg, South Africa but came to London in 1996 when he wanted to pursue a career in product design. 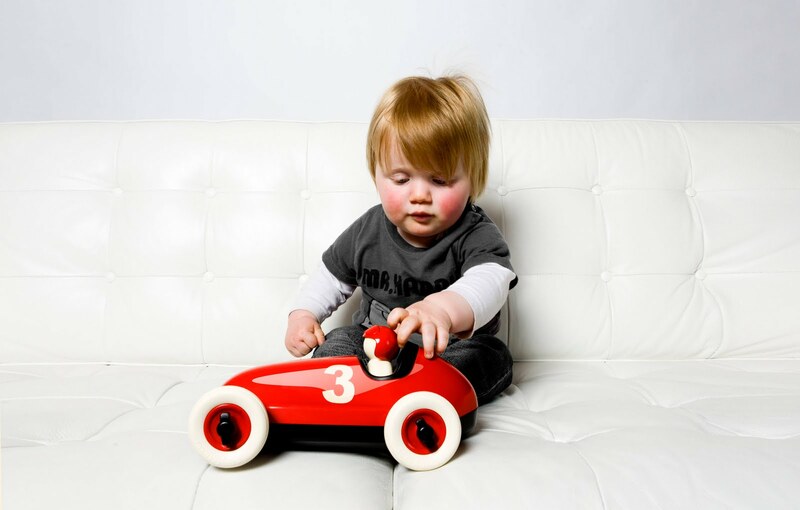 While preserving the classic nature of a toy car or toy plane, they take toy design to the next level. You can get YOURS at the COOP! 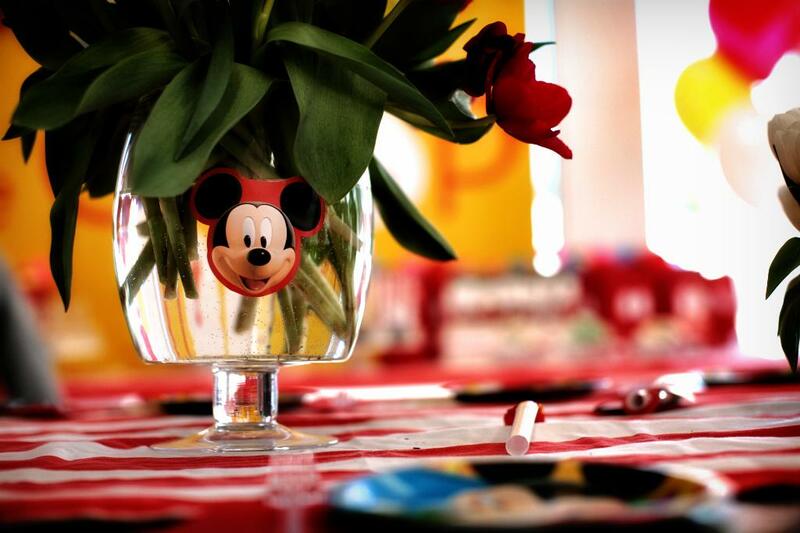 the wonderful world of MICKEY! This past weekend, we did a beautiful MICKEY MOUSE party for a special little guy who was born at just one pound! Needless to say he and his gorgeous parents had much to celebrate on his first birthday -- and we were so happy to join in on the fun! 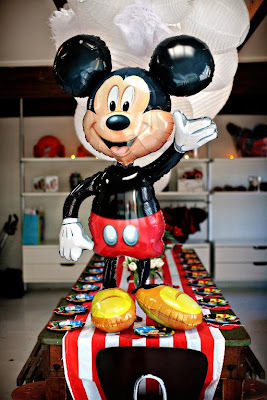 As you can see, we did the big MICKEY airwalker Balloon to welcome all the guests in to the party. 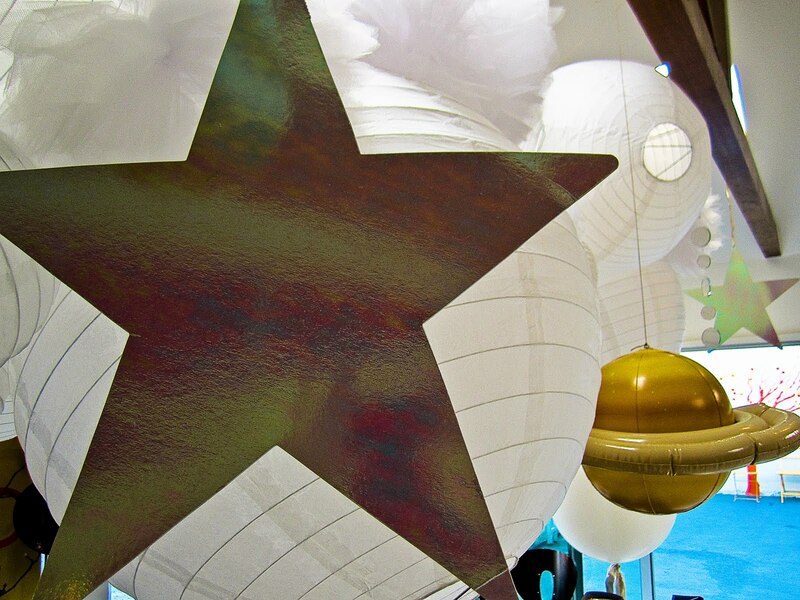 It really set the tone and made for quite an entrance! 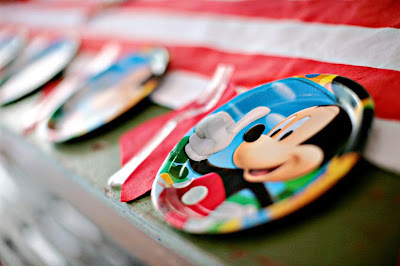 The table was in our fabulous red and white striped runners -- and we did branded Mickey plates (Mickey is even holding up one finger to celebrate the milestone BDay!). We did beautiful white and red tulips as centerpieces for the main table -- and stuck a cute MIckey face on the vases (theme-ie -- but still chic!). 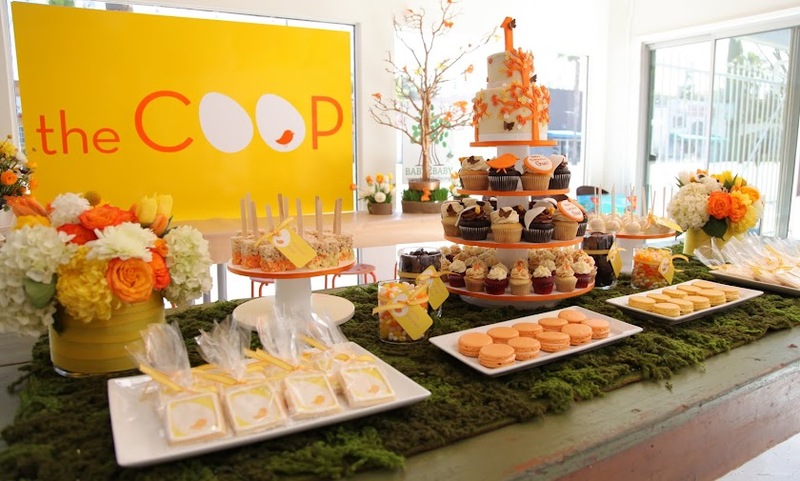 The dessert table really stole the show (again....a blue cupcakes masterpiece), with all the yummy treats and the adorable goodie bags. 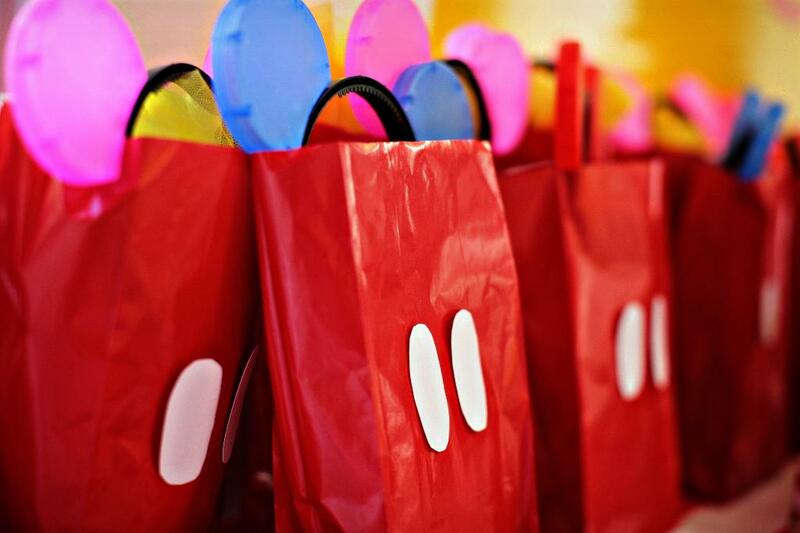 The bags were just red paper sacks -- that I customized with sparkly white "Buttons" like on Mickey's pants. I really loved how they turned out. The girls all got Yellow tutus and PInk light up mouse ears (a la Minnie Mouse) and the boys got red capes and blue or red light up ears.... along with stickers and blowers and a few other little branded Mickey items for all. It really looked lovely -- and was such a beautiful happy way to celebrate such an amazing little boy! 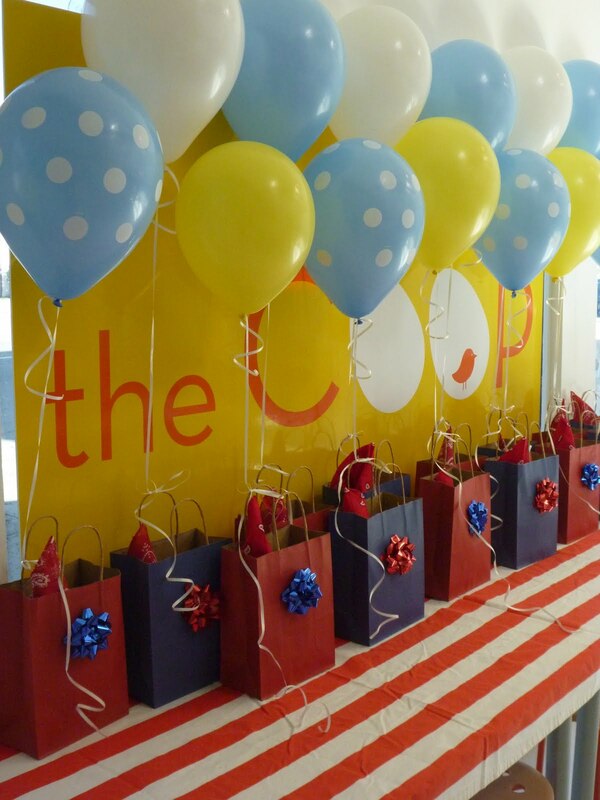 "No better place to have a bday party for kids then #thecoop in Studio City. 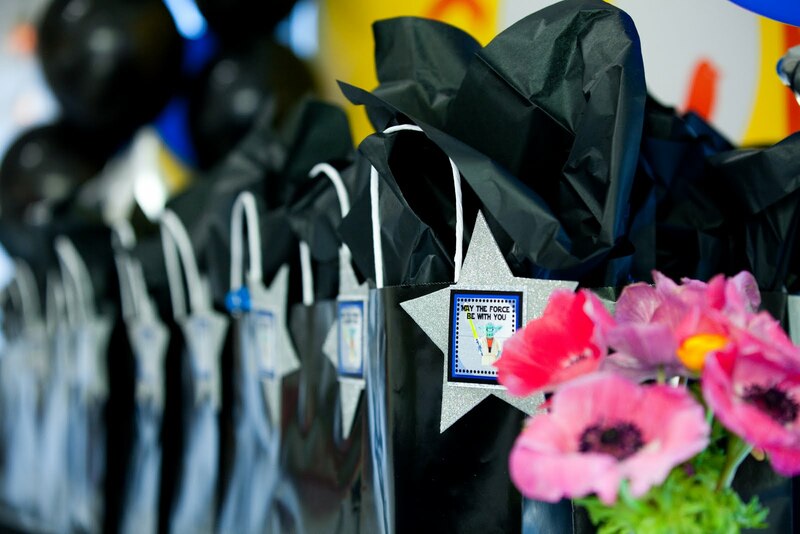 They did an amazing job!" Annabeth Gish we love you too! This mom -- I loved! She went through our website -- looked at all the pics and knew EXACTLY what she wanted for her son's train party. Not Thomas. She didn't want branded (we LOVE that!). Tie dye balloons, yes please - sparklie garland, yes please, blue cupcake cake and cupcakes, yes please -- FLOWERS, a resounding YEEEEEEES please! I believe so strongly in flowers to really add impact to a space and to make a party beautiful. 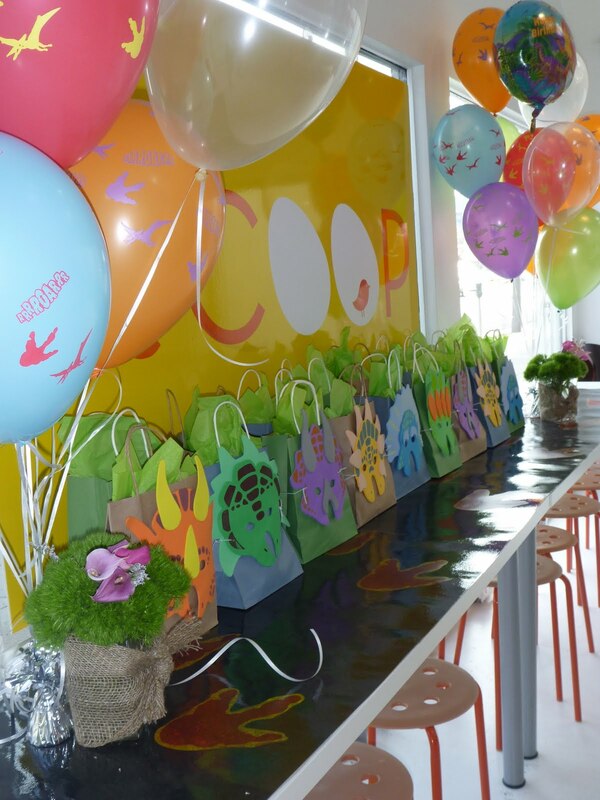 If Lucy and I had our way -- we would have LOADS of fresh flowers at the COOP all the time. But unfortunately -- that is quite costly -- and just not feasible. Not to mention the TIME it takes to go to the flower mart, pick out flowers and then come home and arrange them. We make an effort to have at least one arrangement -- but we just can't go as crazy with the flowers as we would love to! 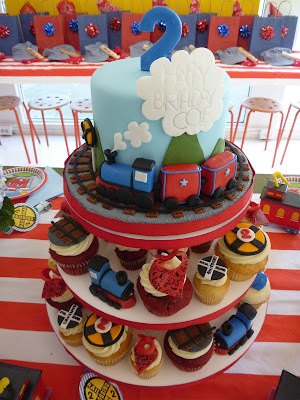 That was the main thing I loved about this party mommie! She had seen the photos of our flowers on our site and blog and said -- please please please -- do what you do with your gorgeous flowers and I will pay for them! LOVE her. 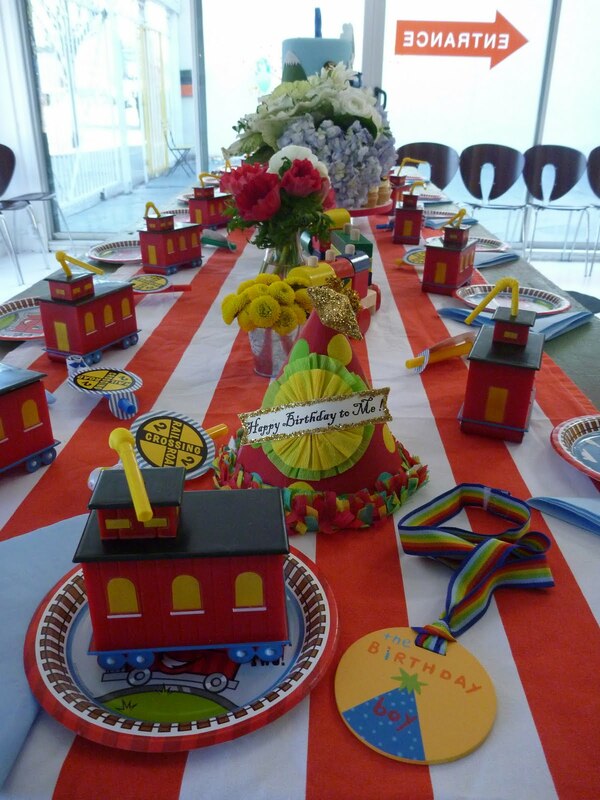 Because the flowers were specifically for her train party -- I tried to stay in the "train" colors of red, white, yellow and blue. Not always easy for me to limit myself in that way when I am at the Flower mart - but I think I did a pretty good job. To me -- the table looks so much more full and gorgeous with flowers....inside/ outside/ gift table -- we did flowers all over. And it makes a big difference, I think. Mom was so happy she gave me a big hug and kiss when she saw them. LOVE her. LOVE flowers. 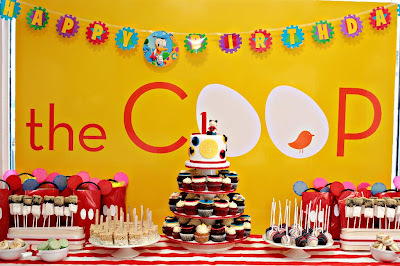 LOVED this party. 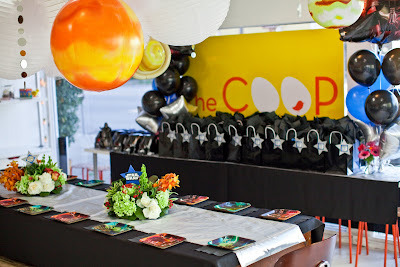 TOP SECRET INFO..... the COOP is the BEST place in LA to host a birthday bash!!!! Actually -- and luckily for us -- that secret seems to be OUT! This was a Spy Party we did this weekend. Our BDay boy was a bit older -- which sometimes makes it harder to really "pretty" it up. The color palate was mostly brown (runners and Briefcase goody bags) and Black (fedoras, magnifying glasses, and spy sunglasses)-- but we managed to liven the look up a bit with some purple and green -- and even a little yellow. The flowers that we added really made the table look special, I think. The colors were really deep rich jewel tones -- so it didn't seem too girlie! I made the TOP SECRET signs out of black poster board and Yellow paper cut out letters and laid them out across the brown laminated runners (again -- these are actually the BACK of a star print table runner... but we just wanted plain brown so we flipped 'em and voila!) The kids were so excited about the hat and glasses (the goodie bag also had laser finger lights and magnifying glasses and a few other spy necessities!) 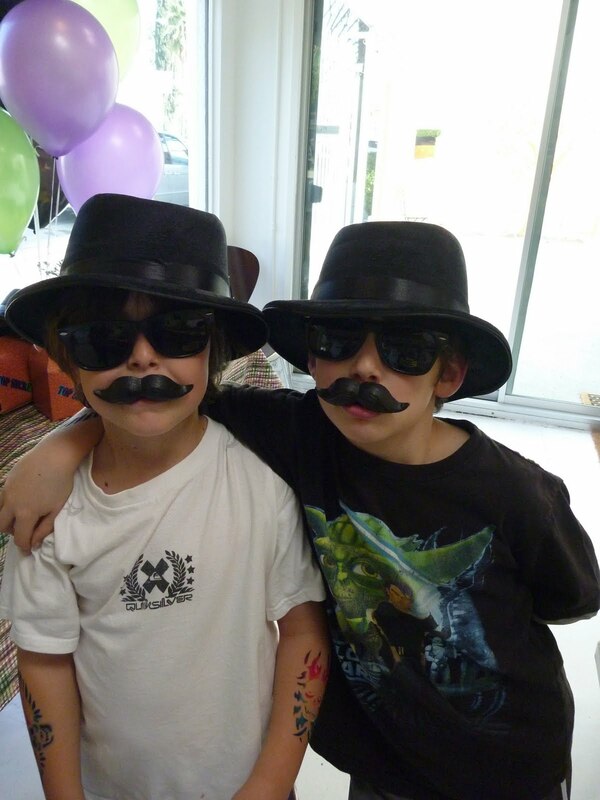 -- and the WAX MUSTACHES!!! They were soooooooo cute. Hilarious -- and equally adorable on the boys and the girls! 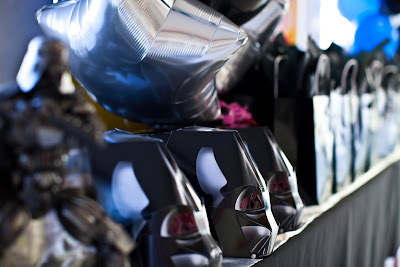 Really fun party... hope you like the pics.